Tributes left for the victims of the Manchester attack will be moved later, but there are plans for a permanent memorial, the city's council has said. Flowers, balloons and other items were left in the city's St Ann's Square after the bombing at the Ariana Grande concert on 22 May. Manchester City Council said they would be moved on Friday evening, with many of the flowers being preserved. Toys and football shirts will be given to children's charities. The attack killed 22 people and injured 116 as they left the concert at Manchester Arena. 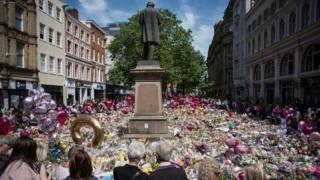 Tributes were initially left outside Manchester Town Hall in Albert Square but were moved to St Ann's Square so workmen could set up the stage for an athletics event. A council spokesman said the "impact of time and bad weather mean that we now need to relocate the tributes and take steps to preserve or appropriately re-use them". Flowers that are in good condition will be pressed and preserved by Manchester Art Gallery with some used in memorial books for the victims' families, a council spokesman said. He added pot plants will be planted across the city centre. Other remaining flowers and plants will be used for compost "to help new life flourish", with help from volunteers from In Bloom groups. The items will be moved on Friday evening to "minimise disruption... because of the number of vehicles which will need to access the square to help move the tributes", he added. Archivists at Manchester Central Library and Manchester Museum will preserve messages left on cards as "an important part of Manchester's social history". Councillor Sue Murphy, deputy leader of Manchester City Council, said: "People should be reassured that neither those who lost their lives or were hurt on 22 May, nor the remarkable resilience and refusal to give into hate which Manchester demonstrated, will ever be forgotten."